Don't Cry Moses, Just Speak. He is my Heavenly Father and I'm His Bride. 10 Years ago my friend bDale Ward left this world. This is my simple attempt to express his music. bDale wrote all these songs. Recorded in 1999. 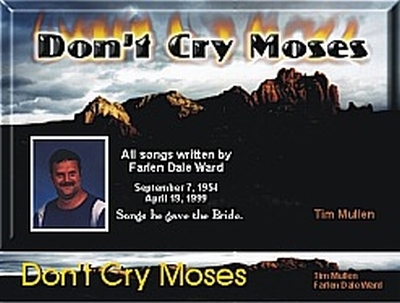 Farlen Dale Ward : All songs are written by Brother Dale. He was one of my first friends in 1987 when I started coming to my present Church. He is (Evangelist) Brother Darrell Ward's brother. Part of this CD is bDale singing. 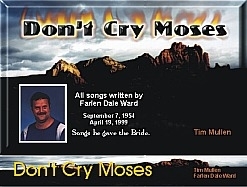 CD: Don't Cry Moses : MP3 : Songs Brother Dale gave us.